“The Yellow Press,” an illustration by L.M. 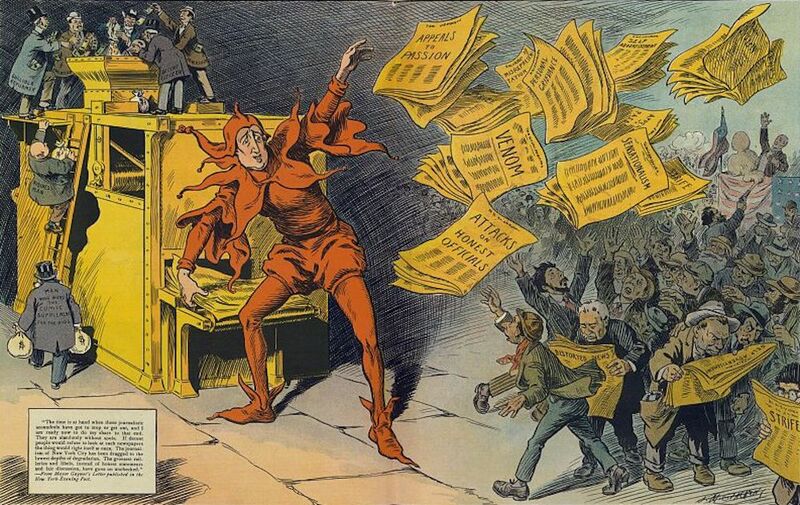 Glackens, depicts newspaper baron William Randolph Hearst as a jester tossing out newspapers crammed with scurrilous sensationalism. Image courtesy of Wikimedia Commons. By giving first-hand accounts of what happened on the ground—or on the casting couch—before reporters arrived at the scene, citizen sources perform an important public service. But behind every citizen we see in the news is another story—about their interaction with journalists and the repercussions of their decision to go public—that audiences rarely know much about. Occasional glimpses behind the scenes are telling—and troubling. A hurricane survivor bawls out a journalist in a video that goes viral. A sexual abuse survivor writes of losing every shred of privacy after deciding to go public. Student gun control advocates later face cyber-harassment and conspiracy theories. I’ve spent the last 10 years interviewing ordinary people about what it feels like to become the focus of news attention. I spoke to victims, heroes, witnesses, criminals, voters, experts, and more. All were private citizens rather than politicians, celebrities, PR professionals, or professional journalists. Their stories raise important questions for journalists and audiences, and for anyone considering speaking to a reporter. They also hold important clues about media trust at a moment when online disinformation is a major concern, and public confidence in mainstream news—long in decline—has reached an alarming low. Understanding how non-journalists see the news media is an essential step in rebuilding public trust. And in fact, one of the most striking lessons I learned from speaking to citizen news sources is how differently they tend to see journalists from how journalists tend to see themselves. My interviewees mostly thought of journalists not primarily as citizens´ defenders against powerful people and institutions, but as powerful people and institutions in their own right. Journalists seem powerful to ordinary citizens for several interrelated reasons. The first is that journalists have a much larger audience than most people can reach through their social networks. Journalists can be gatekeepers to publicity and fame. But, most important, they control how people’s stories are told to the public: what is included, how it is framed, and who is cast as the hero or the bad guy. Those decisions can have favorable or destructive consequences for the people they are reporting about—consequences that are magnified online. And yet, journalists seem to dole out those benefits or damages pretty cavalierly. To many non-journalists, the news media’s relationship to the public seems fundamentally unequal, and potentially exploitative. Ordinary people who make the news experience that inequality first-hand. Even when journalists are compassionate, friendly, and professional—which many of my interviewees found they were—the structure of the encounter usually feels lopsided. News subjects are usually more deeply invested and involved in newsworthy events than journalists. That’s why journalists seek them out. Subjects were there when the shots rang out or were on intimate terms with the deceased. They feel these are their stories. And yet, journalists swoop in, sometimes in packs and with intimidating equipment, to gather what they need in a process that feels both invasive and mysterious. Often people decide to speak to reporters because they see it as an opportunity to address the public about an important issue, or enjoy the benefits of publicity. But the price of inclusion in the news product is control over how their story is told. Journalists quickly move on to the next story. Subjects stay on the ground to clean up the rubble and bury the dead—and manage the impact of the news coverage on their lives. At a time when everything is Google-able, that impact is exacerbated by online publication in two main ways. The first is that mainstream news articles perform very well in online searches. Old articles, once relegated to basement archives, now pop right up when you search for someone´s name, often at the top of their search results, and stay there possibly forever. Speaking to the press about sexual harassment, for example, was always risky. Today it brings with it the prospect that anyone Googling you in the future—employers, landlords, students, dates—will know about that episode in your life. Cyberabuse is the other big problem. Studies find online harassment is increasingly common, with women and minorities reporting more serious cases. The controversial issues and breaking news events that thrust ordinary citizens into the media spotlight tend to trigger strong sentiment. That has long been true, but, before the internet, it took more effort to contact people named in news stories. Today we consume news on the same devices we can use to contact those people. Many of my interviewees reported receiving social media messages from strangers—some supportive, some abusive—as well as seeing themselves become fodder for online commentary. Not all news stories trigger digital blowback, but I have found that controversial stories, like those challenging gender norms, almost always do. Despite the sometimes unforeseen consequences of their news appearances, most of my interviewees liked the reporters who wrote about them and felt they had benefited from the experience overall. But in most cases that one positive experience appeared to do little to shake their negative attitudes toward the news media as a whole. That reporters don’t always take unethical advantage of their position was a welcome discovery to some interviewees, but it was not nearly as salient as the feeling that they always could. Q: Is there anything else you think I should know? CATY: My biggest thing is, the press has so much power. They should know the power they hold, and they should be ethical. The doctor is there to take care of a patient, over anything else. The press is there to tell the truth. And that’s been lost. To many of the people I have interviewed, like Caty, the news media was a powerful entity that hulked over the citizenry. It was supposed to look out for citizens, but often took advantage of them instead. In short, it was a bully. That helps explain why, shocking as it may seem, people may find it cathartic to see a news subject lash out at a reporter, whether it’s a hurricane survivor, a congressional candidate … or even the President of the United States. The idea that many citizens feel like David to the news media’s Goliath may be hard for journalists to stomach or believe. It is the exact opposite of how journalists normally think of themselves. In their view, the news media works and fights on behalf of the people. Journalists are David, facing down the powers that be in the name of the citizens. And yet, if news institutions want to regain long-waning public trust, they need to address the widespread perception that the news media is more interested in serving itself than the public. They would do well to highlight not just their accuracy, but their care, empathy, and ability to listen to the little guy.